Camera IconDenise Satterley, Rhonda Wyllie, Julie Bishop, Peggy Ninkov. Denise Satterley hosted a lunch for some of Perth’s most powerful woman on Friday in tribute to Julie Bishop’s 20 years in politics. Mrs Satterley is a local philanthropist and wife of prominent property developer Nigel Satterley. 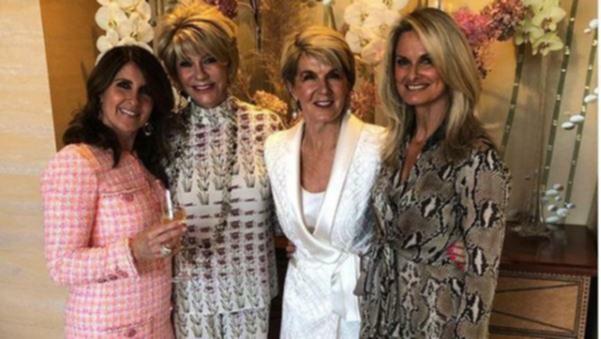 Ms Bishop shared a photo of herself with her fellow “ladies who lunch” including Australia’s richest woman Rhonda Wyllie, with the caption Girls Just Want to Have Fun. The former foreign minister looked stylish in a tuxedo dress by new Perth-based women’s fashion label Meraki Official. The label was launched only earlier this month. Samantha Wyllie, the daughter-in-law of Rhonda Wyllie, founded the label and Perth designer Alvin Fernandez is the brand’s creative director. Ms Bishop was due to cheer on the West Coast Eagles at last night’s western derby.